Fig. 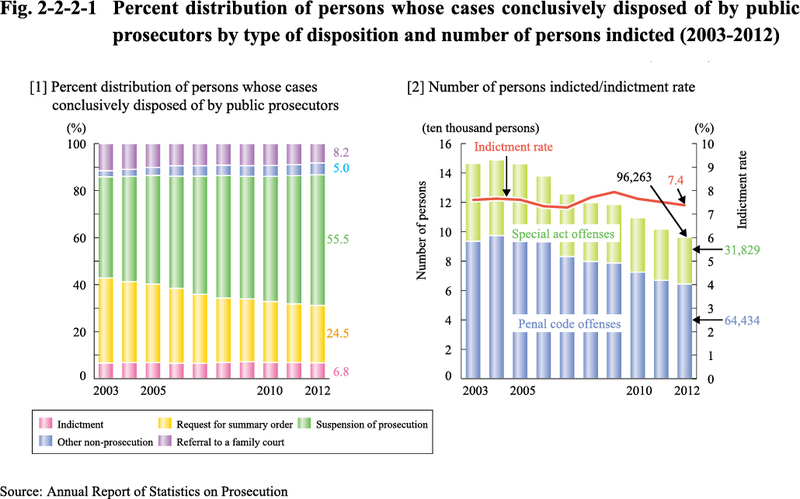 2-2-2-1 shows the percentage of persons whose cases were disposed of by public prosecutors (including juvenile cases) by type of disposition, and  shows number of persons indicted, and the indictment rate (See Appendix 2-2). Fig. 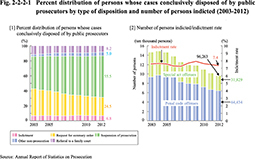 2-2-2-2 shows the number of persons whose cases were disposed of by the public prosecutor and the disposition with respect to different types of offense (See Appendix 2-3). 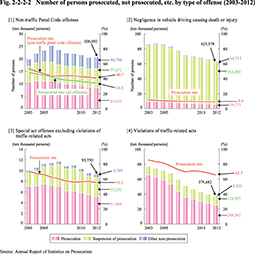 Table 2-2-2-3 shows the number of persons not prosecuted by reason (limited to those disposed for non-traffic penal code offenses and special act offenses excluding violations of traffic-related acts).